Pegasus | Learn about Greek Mythology,Greek gods,Greek mythology stories! When Perseus beheaded Medusa , which was pregnant by Poseidon , sprang from the intersection Chrysaor ,the father of Gyrioni and Pegasus. In a testimonial, the winged horse was born from the blood that fell in the sea. Then Perseus riding him managed to escape the pursuit of the other two Gorgons sisters of Medusa, or the most common form of myth, with his winged sandals. Pegasus was therefore the son of Poseidon and Medusa. According to Hesiod its name is due to "sources" of the ocean where it was born, so the name is said to have relationship with sources. Pegasus, winged as it was, came to Mount Olympus, and lived in the service of Zeus for the transportation of the lightning from the workshop of Hephaestus in Olympus .According to the mythological tradition that prevailed in Corinth, Pegasus was eminently Corinthian deity, for which they were cut coins with the-appearance of the winged horse. Saying that once Pegasus sprang from Medusa, flew to Akrocorinth and quenched its thirst in the waters of Peirini source, hence "Peirinios colt". Then traditions of the Corinthians associate Pegasus with tradition Velerofonti and Chimera. The relationship of the nine Muses with the winged horse Pegasus is due to the following tradition : When the Muses competed once in the song with the daughters of Pierus ,at the river Helicon when the Pieri daughters just started singing, darkness covered everything. Shortly after, when was the turn of the Muses , everything seemed like it stopped , the sky , the sea ,the rivers ,to listen to the exquisite hymns , and river Helicon was raising to the sky with joy and pride until it was stopped by the winged Pegasus kicking him with its hooves, by order of Poseidon, . From the kick was born the source of Helicon , whose waters inspired the Muses , and the so-called Hippocrene . In later myths Pegasus is mentioned as horse of Eos gift from Zeus to drag her chariot. In still later times Pegasus was regarded as horse of the Muses,crested poets of love and with which they flew up to stardom. 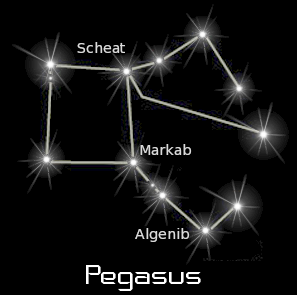 Eventually the gods offered Pegasus an eternal place in heaven creating the constellation of Pegasus. 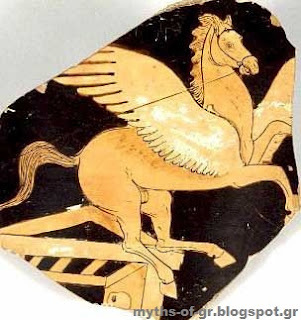 Many were the performances of Pegasus mainly in currencies and stone paintings during the Mycenaean times until the Roman past,as a horse with wings. Apart from the podium of the chariot of Poseidon and Amphitrite, in Corinth which the sternum and below is depicted as a sea hull.